followed with the 5th nutcracker in this series, Tchaikovsky in 2017.
seeing perhaps a Toy Soldier and a Sugar Plum Fairy in the future! "Nutcracker Suite" Series Tchaikovsky himself becomes the fifth release in this series of nutcrackers which will surely include all the major characters from his most famous ballet. Clara and the Mouse King are depicted upon the stage in that held by the author with a small nutcracker Prince at his feet. 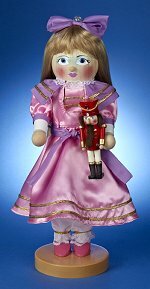 Limited Edition of 5,000 pieces 17-1/2 inches - 44,5 cm 2017 Introduction - 5th in the Nutcracker Suite Series Made in Germany by Steinbach Volkskunst GmbH NEWEST & In Stock! "Nutcracker Suite" Series Clara will become the third release in a new series of nutcrackers which will surely include all the major characters from Tchaikovsky's most famous ballet. Clara receives a nutcracker from her uncle Herr Drosselmeyer in the world famous ballet. 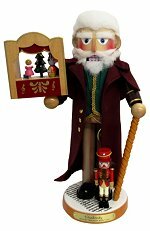 Limited Edition of 5,000 pieces 15 inches - 38,0 cm 2015 Introduction - 3rd in the Nutcracker Suite Series Made in Germany by Steinbach Volkskunst, GmbH Sorry - Currently Out of Stock! Please check back in late Spring 2019! 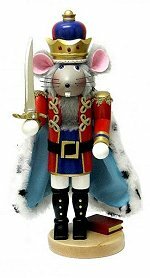 "Nutcracker Suite" Series This Nutcracker Prince is the second in a new series of nutcrackers which will surely include all the major characters from Tchaikovsky's most famous ballet. The Prince comes to life later in the ballet to do battle with the Mouse King who represents the dark side. Limited Edition of 5,000 pieces 21 inches - 53,0 cm 2014 Introduction - 2nd in the Nutcracker Suite Series Made in Germany by Steinbach Volkskunst, GmbH Marienberg, OT Gebirge, Saxony Sorry - RETIRED & Out of Stock! No Longer in Production!